In the mid-1960's the muscle car era was gaining momentum and Oldsmobile threw its hat into the ring in late 1964 with the introduction of a new model called the 442 that was based on its popular F85 Cutlass model. Initially, it was called Option Number B-09 Police Apprehender Pursuit and, as the option name implied, it was intended for police work. With its introduction, this option cost an extra $285.14 over the regular, everyday F-85 Cutlass price. In addition to equipping the 442 with a 4-speed gearbox, 4-barrel carb and dual exhausts (hence the 4-4-2 designation), the package also included heavy-duty front and rear springs and shocks, a sturdier anti-roll bar up front as well as one in the rear and 7.50x14 Red-Line bias-ply tires. These items brought the car's usually soft springing up to a nice, firm combination that gave a solid feeling of control and handling with little, if any, loss in riding comfort. The color is Sierra Mist. All the 442s were based on the Cutlass F85 body and chassis, with performance and suspension modifications, special badges and trim setting them apart. 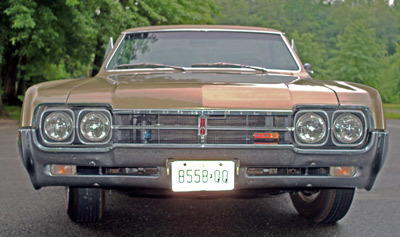 In all, five Oldsmobile 442 models were offered in 1966. 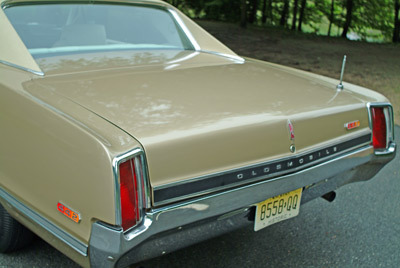 The 442 was a success for Oldsmobile, and it continued to evolve in both styling and performance through 1965 and beyond. In 1966, there were five variations of the 442 offered: the 442 Cutlass Holiday Coupe, the 442 Cutlass Sports Coupe, the 442 Cutlass Convertible, the 442 Deluxe Holiday Coupe and the 442 Club Coupe. Note that on these latter two models, the "Cutlass" designation was not present in company literature. In the glory days of muscle cars chrome was as important as the special 442 insignias in defining the looks of the car. Our feature car is a 1966 Model 3817 Cutlass Holiday Coupe. The color is Sierra Mist and this car has many of the optional creature comforts available in 1966 - factory air, power steering, brakes, chrome super stock wheels, sports console, vinyl roof, dual headrests, the deluxe radio with power antenna and the special-duty 3-speed Jetaway automatic transmission. The optional chrome super stock 14" wheels with the Oldsmobile center cap give the car a distinctive look. 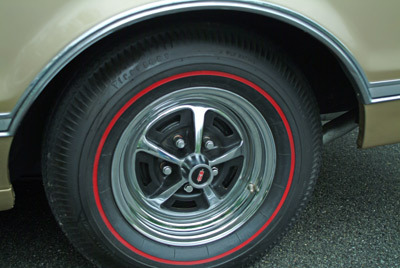 The Red Line bias ply tires were state of the art rolling rubber in their day. Now, you have to remember that when this car was made Detroit was in its high-performance heyday, and more horsepower was produced by increasing displacement and compression ratios. 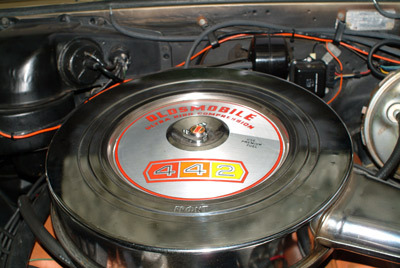 The 442s for 1966 were equipped with 400cid V-8s producing 350hp and 440 lb.-ft. or torque. 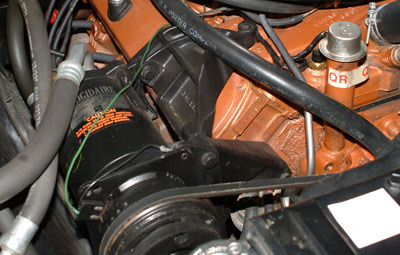 These engines, with their Rochester Quadrajet 4-barrel carburetors and compression ratios of 10.5:1, required a high-octane diet of Sunoco 260, which was available right at the pump in those days. The standard axle ratio for the 1966 442 was 3.55:1. The broad, rectangular nose of the 442 gave it a no-nonsense look. Originally intended as a police pursuit vehicle, the 442 proved to be a very popular muscle car. 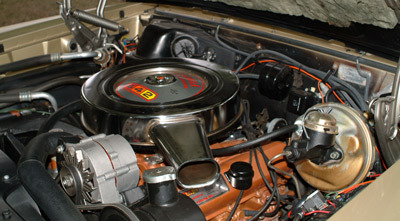 A heavy-duty radiator, a 70-amp/hour battery, self-adjusting brakes and a guard-beam frame were among the other standard features of the 442 model. Its exterior features included a recessed rear window, curved glass on the side windows, a windshield washer and 2-speed wipers with glare-resistant arms and blades, a left-hand outside rearview mirror and windshield, rear window and roof drip moldings. New for 1966 were front fender vents, body side and wheel-opening moldings, along with dual back-up lamps. 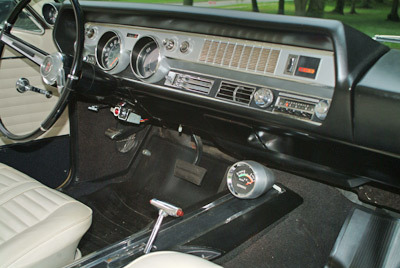 While the usual 4-speed manual trans was used in the majority of Oldsmobile 442s, this one is equipped with the 3-speed automatic Jetaway transmission. 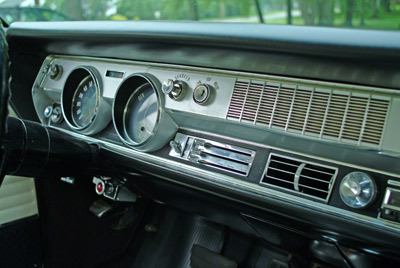 The console-mounted vacuum gauge was part of the extra-cost sports console option on the 442; based on intake manifold vacuum, it indicated either economy or performance. The car's curb weight was a hefty 3,660 lb. and it had a wheelbase of 115.0" with an overall car length of 204.2". Its width was 75.4" and its height, loaded, was 53.7". A large car, its trunk held 20.1 cu. ft. of cargo. The fuel tank had a 20-gallon capacity and the standard wheels were 7.75x14" units. The deluxe white vinyl interior features Strato Bucket Seats, B30 wall-to-wall floor carpeting, a deluxe steering wheel and extra chrome and stainless trim. 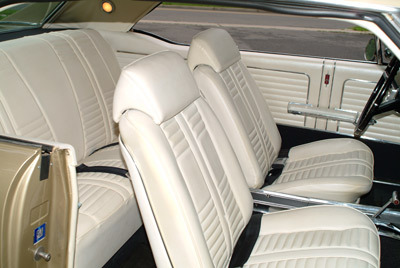 The interior was quite roomy as well, providing head room of 37.4" in the front and 36.2" in the rear. Front leg room was 41.3" and 33.3" in the rear, with front hip room of 59.9" and 58.6" in the rear. Shoulder room was also quite generous, yielding 58.8" forward and 57.1 in the back seat. Entrance room for the two-door coupes and convertible was 28.9" overall. 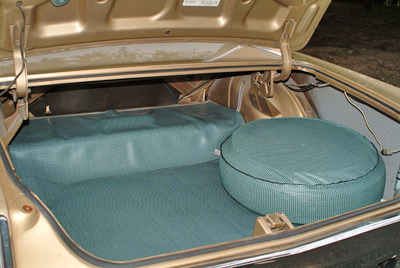 The trunk is very large and features ample stowage for luggage, golf clubs, a body or two, or what have you. 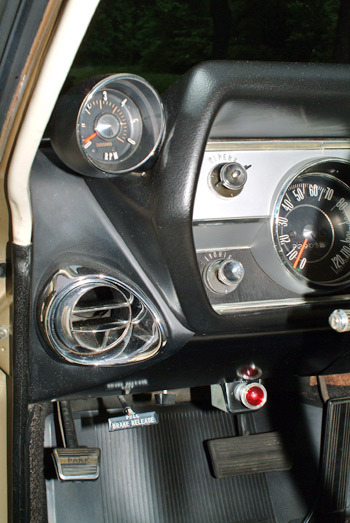 The dash-mounted tachometer was rather pricey option in 1966 at $52.28. Note the dealer-installed four-way hazard flasher under the dash with red indicator light. The massive air cleaner tells it all, admonishing the driver to use only premium fuel in the ultra high compression Oldsmobile engine. 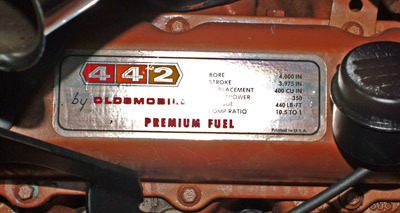 The decal on the driver's side valve cover gives the vital statistics of the engine. It has a bore of 4.000 inches, a stroke of 3.975 inches, a displacement of 400 cubic inches, a horsepower rating of 350 and it produces 440 lb.-ft. of torque thanks to a 10.5:1 compression ratio. The brake booster and power steering pump, both visible here, help to take the work out of stopping and steering this large, fairly heavy car. The original Frigidaire compressor still blows cold air using its R12 Freon refrigerant. The QR tag on the oil filler neck is a factory quality-assurance inspection sticker. 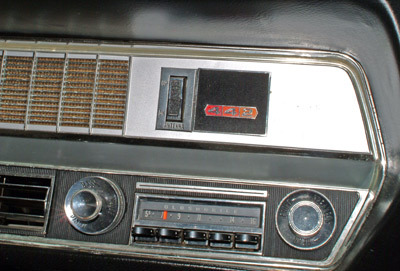 The power radio antenna was a $29.12 option, and the deluxe radio also cost an additional $63.78. The 1966 Oldsmobile factory brochure described this as the “Action center for the most exciting 442 ever to put rubber to road! All instruments are recessed, glare-proof — easy to read and reach.” The padded dash and padded sun visors were standard equipment as well.